OUCET 2017 Results & Download OUCET 2017 Rank Card: Osmania University conducted 2017 Osmania University Common Entrance Tests (OUCET 2017) from 5th June to 13th June 2017. OUCET is a common entrance test for admission into various PG, PG Diploma and 5 year integrated Programmes offered by Osmania University, Telangana University, Mahatma Gandhi University and Palamuru University. The candidates who were appeared for OUCET 2017 Exam are eagerly waiting for the results. As per announcement of the Osmania University OUCET 2017 Results will be declared on 3rd July 2017 in Osmania University Directorate of Admissions official website http://oucet.ouadmissions.com or in Manabadi.com. The candidates who were waiting for their 2017 OUCET Exam can download their results as well as OUCET 2017 rank Cards by entering their Hall Ticket number and Date of Birth correctly. 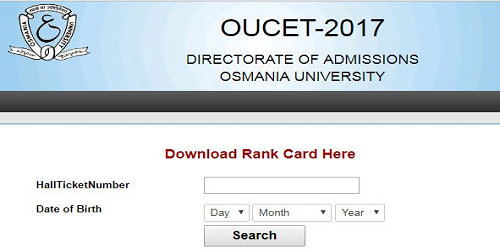 The rank Cards are useful at the time of OUCET 2017 Counselling. So, Download the OUCET 2017 Rank Card after checking the results. Osmania University will soon announce the Counselling Schedule of OUCET 2017. 2. Go through Osmania University P.G Entrance Test (OUCET) 2017 Rank Card link. 3. A new window will be opened which is related to OUCET 2017 Rank Card/Results login page. 4. Enter the OUCET 2017 Hall Ticket Number and your date of birth correctly. 5. Click on Search button. 6. OUCET 2017 Results status/Rank Card will be displayed for the given details. 7. Download it or take a printout of it for future reference.